Family members of the suspect in a mass shooting that killed 17 people claim that he has been taking medications for depression and emotional issues. Parkland, Florida – At least 17 people were killed and 15 were wounded during a mass shooting at a high school in Florida on Wednesday, and the reports that have been released about the suspect indicate that he was taking medications for depression and emotional issues that come packed with dangerous side effects. Nikolas Cruz, 19, is accused of entering Marjory Stoneman Douglas High School and opening fire on his fellow students after he was previously expelled for disciplinary reasons that have not been made public. The Miami Herald reported that Cruz has raised red flags at school in the past, and last year a teacher submitted a warning against letting him on campus with a backpack. Former classmates said they were not surprised by the shooting. Joshua Charo told the Herald that Cruz fit the description of a disgruntled student who would carry out a mass shooting. John Crescitelli shared the same sentiment, saying his son had warned him about Cruz before. “If you were to pick one person you might predict in the future would shoot up a school or do this, it would be this kid,” he said. An Instagram account attributed to Cruz that was taken down after the shooting showed a number of photos that displayed his love for guns, knives and killing small animals and rodents. The people who knew Cruz described him as a troubled teenager who was adopted when he was young and then was forced to move in with a friend after both of his adopted parents died. Jim Lewis, an attorney for the family that gave Cruz a place to live after his mother died in November, told The Washington Post that they knew Cruz was depressed, but they believed he taking steps to manage his depression. Family member Barbara Kumbatovich told the Herald, “she believed Nikolas Cruz was on medication to deal with his emotional fragility.” She was a sister-in-law of Lynda Cruz, the suspect’s mother, and she also told the Sun-Sentinel that she believes Nikolas has been on medications for several months. An anonymous relative added another description, telling the Sentinel that they believed Cruz has been diagnosed with autism. While it is not clear how many medications Cruz was taking, the pharmaceutical drugs prescribed for depression and emotional issues are packed with a number of side effects that can lead to violent behavior. As The Free Thought Project has reported, Las Vegas shooting suspect Stephen Paddock was prescribed the anti-anxiety drug diazepam in June, a few months before he was accused of opening fire out of his bedroom window at the Mandalay Bay Hotel, and killing more than 50 people. Aurora shooting suspect James Holmes killed 12 people and injured 70 when he opened fire inside of a movie theater in 2012, and he was also found to have been taking the antidepressant Sertraline, a generic version of the Selective Serotonin Reuptake Inhibitor (SSRI) Zoloft. Gavin Long, the veteran who went on a shooting rampage in Baton Rouge, Louisiana, was prescribed Lunesta and Ativan, both of which have an extended list of adverse side effects. 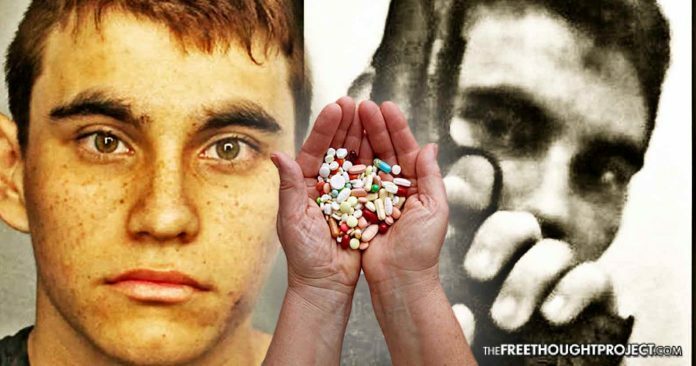 Both Lunesta and Ativan have overlapping side effects of aggression, agitation, changes in behavior, hallucinations, suicidal thoughts — and homicidal ideation. Homicidal ideation is a common medical term for thoughts about homicide. There is a range of homicidal thoughts which spans from vague ideas of revenge to detailed and fully formulated plans without the act itself. There have been 150 studies in 17 countries on antidepressant-induced side effects. There have been 134 drug regulatory agency warnings from 11 countries and the EU warning about the dangerous side effects of antidepressants. Despite this deadly laundry list of potential reactions to these medications, their use has skyrocketed by 400% since 1988. Currently, 11 percent of all Americans 12 years of age and over take antidepressant medication, which is a higher rate than all other countries in the world. An investigation conducted by the BBC found that in the United Kingdom, antidepressants have been linked to 28 reports of murder and 32 cases of murderous thoughts referred to the UK medicines regulator in the last three decades. As details emerge from the shooting, causing several lawmakers to call for gun control, many will ignore that fact that the suspects from most of the deadliest U.S. mass shootings in recent years also had access to dangerous pharmaceutical drugs that can lead to violent behavior and can worsen the mental illnesses they are prescribed to treat.